Socks are the hip accessory of the moment. Lots of people are wearing really bold, colorful designs, and more than a few fashion-conscious folks I know have adopted the hipster habit of wearing mismatched socks on purpose as a way to funk up their wardrobe (and mess with people’s heads). So if you have a friend who is currently riding this style trend, blow their mind and give them a pair of these caped superhero socks. 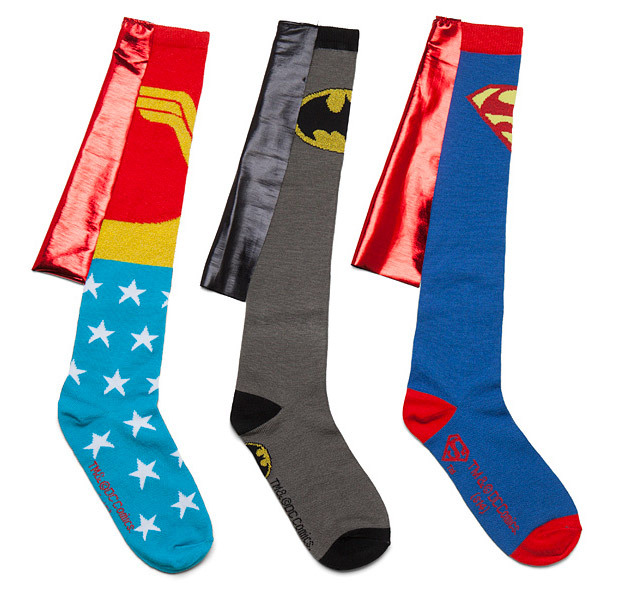 These long stockings come in Wonder Woman, Batman and Superman models, and each one has a sleek, mini cape that dangles from the top. It’s an ingenious idea I wish I would have thought of, and looking at them makes me envision someone streaking across a field with their sock capes flapping in the wind as they race to save someone in distress (or try to catch a Frisbee). There are two things, however, that bother me about these dashing socks. First, the manufacturer says they are for ages 14 and over, and I know for a fact I could have handled wearing these when I was 13. Second, there is a disclaimer explaining, “Warning: Socks do not allow wearer to fly.” So does that mean a TSA agent is going to ask me to remove them the next time I go through airport check in if I have them on?